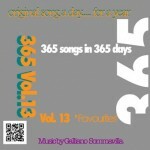 Galliano Sommavilla has created a song a day for 365 days, creating a number of albums from the constituent compositions. We have received the 13th volume, which begins with day 352. The track is a smooth bit of new world music that links together traditional (piano) and electronic elements. The effort succeeds as it provides listeners with a cogent narrative crafted through the interaction of the various instruments. The ultimate effect of this opening composition is that listeners will be interested in continuing with the album. Day 25 (Mr. Gal) has a quicker tempo and more deliberate feeling. The track feels as if it is an opening for a noir film, eliciting visions of a rainy metropolis. The woodwind/flute element that plays at the top of the track adds further layers to 365 Volume 13, while the longer run time (around five minutes) gives Sommavilla more than enough time to establish different themes and interactions on this composition. Day 244 (I’m Still Believin’) has a funky groove that takes 365 Volume 13 into a bold new direction. The track refreshes the new-funk style of Chromeo into something that will appease fans of Sommavilla’s style as well as those that still have Motown records up on their mantle. Day 100’s “More than Fair Too”keeps things interesting as Sommavilla brings a Flamenco/Spanish guitar style to the opening of the track. This style is imbued with Sommavilla’s inimitable style as the tempo begins to pick up. The richness of the composition will require listeners give this track a number of plays before hearing everything that has been placed into the composition. We have reviewed Volume 13 of Sommavilla’s 365 project, but previous volumes have a number of distinct tacks from what we have heard. Visit Sommavilla’s website for more information about Vol. 13 and the rest of this unique project.